Hawaii's Tara Hittle slammed a kill over Eastern Washington's Courtney Goodson in the Rainbow Wahine's 31-29, 30-15, 30-20 victory over the Eagles last night. The alarm clock wore red and white last night. Fortunately for Hawaii, the snooze button became unstuck at the right time against Eastern Washington. The 16th-ranked Rainbow Wahine had their pride pushed to the limit in Game 1 before pushing back hard against the Eagles. Aneli Cubi-Otineru had 11 kills and Jamie Houston added 10 as Hawaii turned back Eastern Washington 31-29, 30-15, 30-20 in the second match of the Waikiki Beach Marriott Challenge. A Stan Sheriff Center crowd of 3,354 (5,630 tickets) saw the Wahine improve to 4-3 heading into tonight's match with a very good Wichita State team. The Shockers (5-2) needed just 95 minutes to shock No. 19 Santa Clara 30-28, 30-23, 30-19 in yesterday's first match. The Broncos (5-2) will try to end a two-match skid against the Eagles (1-6) in today's 5 p.m. opener. "I don't know how they've lost two," Hawaii coach Dave Shoji said of Wichita State. "That's an awfully good team. We'll have our hands full tomorrow." 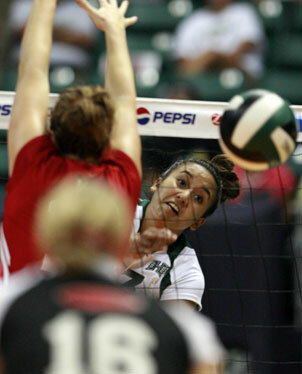 The Wahine had their hands full last night against a very young EWU team that returned just one starter from last year. The Eagles had two game points on Hawaii in Game 1 -- the second at 29-28. Hawaii pulled it out by scoring the final three points, capped by a monster kill from Juliana Sanders. "We've been in that situation before so many times, I wasn't worried, we know how to fight back," UH sophomore defensive specialist/libero Jayme Lee said. "We've been coming out a little slow in games, still adjusting, still working on the things we need to take care of." Shoji took care of his goal of playing all 17 on his roster. The reserves responded with solid efforts, including senior middle Caroline Blood, who put down the match-ender after 95 minutes. Also showing off her athleticism was freshman middle Amanda Simmons, who had five kills with one error in six swings. "I'm happy when I can get all of them in," Shoji said. "It's not many times that we can do it. They're all great kids who work hard and deserve to get in." He was able to use a number of lineups, including Simmons and Amber Kaufman in the middle. Freshman hitter Stephanie Ferrell also saw the court for the first time. Alysha Cook put down nine kills for EWU. "To win Game 1 would have been very, very sweet," Eagles coach Irene Matlock said. "We're so incredibly young, maybe didn't know that we shouldn't be winning. "Our focus is to learn more each time we play and we've gotten better each time. We're here to learn as much as we can. 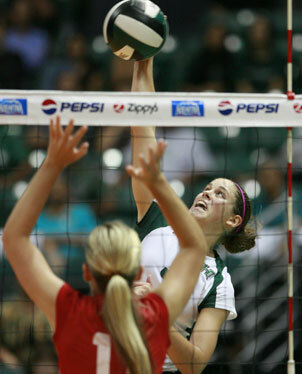 Aneli Cubi-Otineru led Hawaii with 11 kills against Eastern Washington last night. The Shockers dominated in most categories, from kills (44-37) to blocks (15-7) to aces (6-3). Sophomore hitter Emily Stockman, one of Tara Hittle's best friends from high school, had 12 kills, 18 digs and five aces. Four of her aces came during a 11-0 run in Game 3 that had the Shockers running away to a 20-10 lead. Senior hitter Sara Lungren finished with a match-high 14 kills and junior libero Kelly Broussard anchored the solid WSU defense with 17 digs. Sophomore middles Katie Niggemeyer and Stephanie Tokarz were in on six blocks each. For the Broncos, sophomore opposite Lindsy Evans had 11 kills. "People are going to hear about this win, this was big," Shockers coach Chris Lamb said. "We've had an identity crisis, been slowed by injuries, and we haven't been able to go hard that much. "For us, we've got to get well at the right time." One of those was last night. It could be a different scenario tonight against Hawaii. "I have amazing respect for Dave Shoji," he said. "K-State took it to us (a 3-1 loss) and Hawaii took it to them (a 3-1 win). Hawaii lost to probably the best Michigan team ever and UCLA is UCLA. "We were steady tonight, didn't get scared. We need to keep doing that, continue to play hard." Aces -- E. Washington (1): Reinstein. Hawaii (7): Brandt 3, Houston 2, Cubi-Otineru 2. Assists -- E. Washington (32): Yausie 30, Ponce 2. Hawaii (49): Brandt 39, Mafua 4, Houston 2, Cubi-Otineru, Kaaihue, Duggins, Lee. T -- 1:35. Officials --Dan Hironaka, Wayne Lee. A -- 3,354.